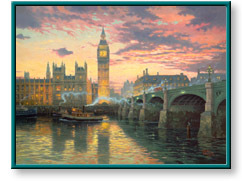 London by Thomas Kinkade is available for sale on paper or canvas, framed or unframed at special discount prices. Select from the following authentic Thomas Kinkade editions: standard numbered, artist proof, gallery proof, examination proof, international proof, publisher proof, renaissance edition, studio proof, Atelier National edition, and masters edition. "The thatch-roofed cottages of rural England have charmed and intrigued me; the splendid manor houses scattered throughout the countryside have tantalized me with their taste of noble living. But I have never before painted the great English metropolis, the bustling, light filled jewel of nostalgia and history that is London." Add $20 for shipping & insurance. London painting by artist Thomas Kinkade (also spelled Thomas Kincade, Thomas Kincaid, or Thomas Kinkaid) can be purchased in art print or canvas form at special sale prices at Christ-Centered Art.